The food industry is fortunate Congress and FDA have not developed more specific requirements for food security. How do you Assure the supplies and ingredients you use are from safe sources? How do you Look after the security of the products and ingredients in your facility? What do you know about your Employees and people coming in and out of your facilities? Could you provide Reports about the security of your products while under your control? What do you do and who do you notify if you have a Threat or issue at your facility including suspicious behavior? Happily, we have not experienced a food scare connected with terrorism. This suggests a need to avoid complacency. In 2004, outgoing Secretary of Health and Human Services Tommy Thompson told the press he believed it would be “easy” for terrorists to target the U.S. food supply. “For the life of me, I cannot understand why the terrorists have not attacked our food supply because it is so easy to do,” he was quoted as saying. Apparently, the terrorists either have other priorities or they were not tuned in to Secretary Thompson’s remarks. There are no rules in place mandating specific measures aimed at avoiding the intentional contamination of food. The Bioterrorism Act of 2002 introduced a variety of requirements including facility registration, recordkeeping and prior notification of imports. These measures, however, are not strictly aimed at preventing acts of contamination. Rather than mandate specific actions, FDA has issued a series of guidance documents that recommend preventive measures to enhance food security. 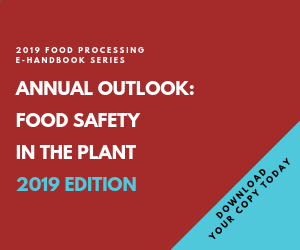 In its guidance, FDA suggests those in charge of security at food processing plants begin simply by taking an assessment of existing food security procedures and operations. Based on this assessment, a security strategy can be prepared focusing on physical safety of the plant, storage, operations and staff security. The security strategy should be reviewed annually to ascertain its effectiveness. In addition, exercises in mock tampering, recall and computer systems security should be conducted annually. Management also should have emergency response and evacuation plans in place, and these should be communicated to staff. The physical security of the plant is key to preventing an act of intentional contamination. FDA recommends all sites have fencing around perimeters and as few entrances to restricted areas as possible. Security cameras or the equivalent should be used to monitor the plant. Furthermore, the plant should be adequately lit at all times, and nooks and crannies should be minimized. Importantly, only necessary poisonous or toxic chemicals should be kept on site, and these should be stored as far away from food handling and storage areas as possible. All such chemicals should be properly labeled and stored, and access to them should be limited. Any missing stock should be immediately investigated. Food processors also must take steps to protect the security of operations. FDA recommends using only known and licensed operators and sources for all incoming materials and taking reasonable steps to ensure suppliers practice appropriate food security measures. A pickup and delivery schedule should be created, and deliveries arriving outside of schedule should be confirmed before being accepted. Off-loading of all deliveries should be supervised. Food should be transported in locked or sealed containers and, ideally, all transporters should have the capability of verifying the location of their loads and drivers at any time. FDA recommends all incoming materials be inspected for evidence of tampering and suspect food be rejected. The employees at a food processing plant are obviously instrumental in protection of the plant’s security. However, management must also ensure employees themselves do not present security concerns. Prior to hiring, a background check should be conducted on each applicant. As is the case with good manufacturing practices (GMPs) generally, food security cannot be subjected to a one-size-fits-all approach. The food industry is fortunate Congress and FDA have not set out to develop more specific requirements in this area. The existing flexibility, however, will only last for as long as it appears to be working. A significant food scare would almost certainly prompt Congress and FDA to consider new requirements. David Joy is a partner at the Washington, D.C. law firm of Keller and Heckman LLP. He specializes in food and drug law with emphasis on the domestic and international regulation of food, food additives, food labeling, antimicrobial pesticides, and medical devices. He is a member of the District of Columbia Bar and holds a bachelor’s degree in chemistry. For more information about Keller and Heckman, visit the firm’s web site at www.khlaw.com.